Here is a video in real time from a professional beekeeper in Greece who used Vita’s swarm lure hung in a olive tree to attract a swarm in very quick time! 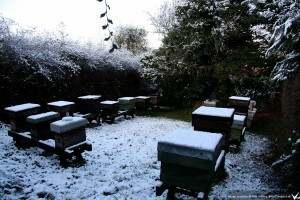 USA Winter Bee Losses – is all as it seems? You’d be forgiven for being encouraged by recent winter bee loss figures in the United States for the 2013/14 season. Preliminary results of a survey conducted by the Bee Informed Partnership state that losses were down by nearly a quarter on the previous winter (at 23.2% against 30.5%). The recently released figures are based on responses from over 7,000 beekeepers across the United States, collectively managing some 564,522 colonies. America has just experienced one of the worst winters in living memory (remember Snowmageddon?). Anecdotal evidence suggests that many beekeepers have experienced unusually high losses because of the conditions. So why doesn’t the survey bear this out? It appears that another factor may be skewing the statistics. A respondent reports that previous questionnaires simply used reported colony numbers at the beginning compared with the end of the season to calculate loss rates. As he comments, however, this did not account for beekeepers that build up their colony numbers in the spring and sell or otherwise pass on some of these new colonies to another operation. The latest survey does factor in colony additions and this alone could account for the discrepancy. It’s possible that losses have remained constant or worsened even while the figures tell another story. The full report is due to be published soon and it will be interesting to see if the authors make any comment on this potential source of inaccuracy and whether they were able to account for it in their results. Let’s hope that this little piece of good news is not an illusion. I should point out that I am not a US beekeeper and, as such, have not seen first-hand surveys from this or previous years. Beekeepers across Britain are reporting very high levels of varroa mite levels early in the season. Vita urges beekeepers to be vigilant and suggests a smart use of Apistan to test infestation levels and to reduce the varroa mite population while undertaking swarm management. Apistan can be a very useful tool both as a 24-hour test of levels of mite infestation and in the slightly longer term to treat the colony during swarm control management. 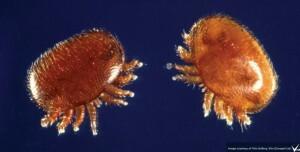 To test for varroa mite infestation levels, beekeepers should insert two Apistan strips for 24 hours in a colony with a varroa screen to trap the fallen mites. If the varroa mite-drop during the 24-hour treatment period is 10 or more, beekeepers need to consider their full treatment options. The Apistan will only have knocked down the mites on the bees and since some 70-90% of mites will be in the brood, the knock-down number is only a proportion of mites in the colony. A longer Apistan treatment would be required to kill the mites in the brood. If no mitefall is seen with a short use of Apistan, it is possible to double-check, in case of high pyrethroid resistance, by sprinkling the bees with icing sugar, for example. 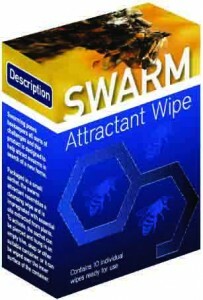 Treatment with Apistan of newly created artificial swarms (without brood) will usually clean a colony of well in excess of 90% of its mites within a few days. The Apistan can then be removed and supers put in place as the colony requires them. The queen-making split of the colony ( with brood) can be similarly cleaned over a period of three weeks as no new brood is being created and most of the varroa in the sealed brood will be killed as it emerges during the three week treatment period. In this way, swarm-managed colonies can be protected even in a season when varroa mite populations start at high levels. Fears of creating resistance to Apistan treatments may not be a concern for beekeepers who have been alternating treatments (ie using an Integrated Pest Management strategy). Recent research at Rothamsted indicates that resistance to the active ingredient of Apistan and other similar treatments does not persist if there is a significant gap of a few seasons between treatments. This also bears out results of research performed previously in Italy and explains why many UK beekeepers who have used Apistan for the first time in several years are seeing good mite control levels. No single type of treatment should be used repeatedly, as this can lead to resistance building up in the varroa mite population. Registered (legal) treatment types should be alternated wherever possible. A local beekeeper has discovered he is now regarded as a beecharmer having worked wonders with a problematic bee nest with the help of Vita’s swarm lure. “The owners of a farmhouse where there has always been a colony of bees entering through the eaves told me that a swarm had arrived the previous day on the other side of the building and were getting into a void there through several small openings at eaves level. While they were happy to live with the original colony they did not want a second one here. “I rather thought that as the bees had already been there more than a day it would be difficult to extract them from their new nest, but I put a nuc box containing the swarm lure sachet on the flat roof above a double bay window near the eaves entrances and about 6 metres off the ground. “By the following evening the colony had moved out of the wall cavity and into the nuc and I was able to close it up and bring it down the ladder. I think I remember you saying that prime swarms were attracted to the higher bait boxes. Heaven’s Gate with Highclere Castle, the setting for Downton Abbey, far below in the background. 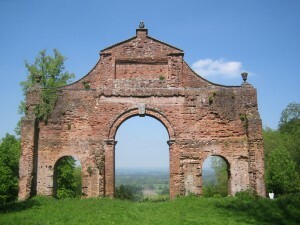 High above Highclere Castle, the setting for the world-famous TV series Downton Abbey, is Heaven’s Gate, a folly built in 1737. The deliberately pointless structure has acquired a use — it’s now home to a colony of honeybees. 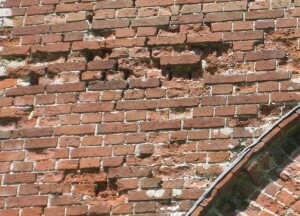 They have found a cavity in the south-facing wall and taken up residence – definitely Upstairs rather than Downstairs honeybees. I noticed these only because I stopped underneath the arch to admire the view yesterday and heard a rather familiar sound. 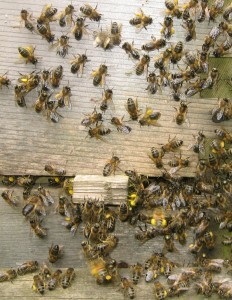 I’m not quite sure how these bees should be treated for varroa. Perhaps some sort of Dumb Waiter Lift needs to be installed to deliver the Apiguard trays. Does anyone know of other odd but appropriate locations for bees? There must be lots.